Lean beef is the only kind I eat on my post-angioplasty diet these days. 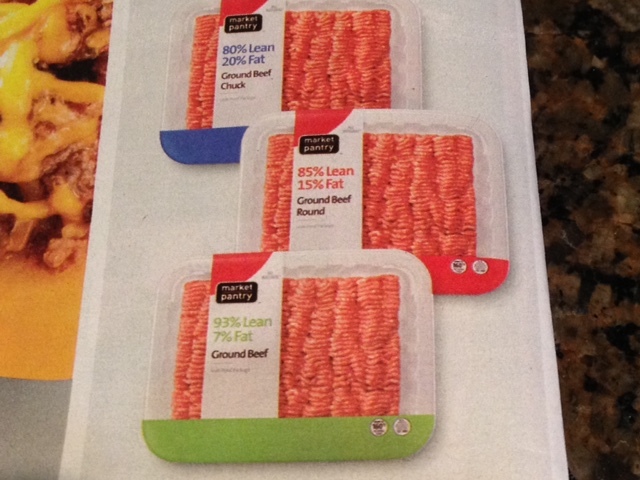 I’ve mentioned how I found 96% lean ground beef at a supermarket chain here in Chicago, Jewel. That remains the leanest ground beef I’ve seen in a supermarket. 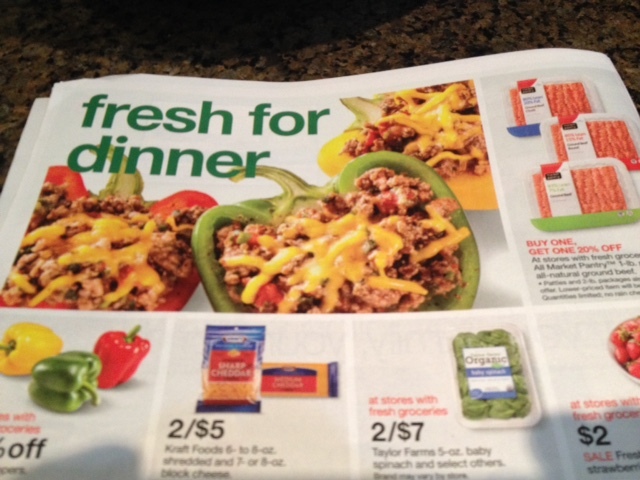 This recent Target add included 93% lean ground beef. Ketchup is a must-have condiment for me, but traditional brands are loaded with salt and sugar, so I’m constantly on the lookout for low-salt alternatives. I’ve already done a taste test of two brands, Westbrae and LocalFolks. Recently I tried another brand, Doc’s Gourmet Ketchup. 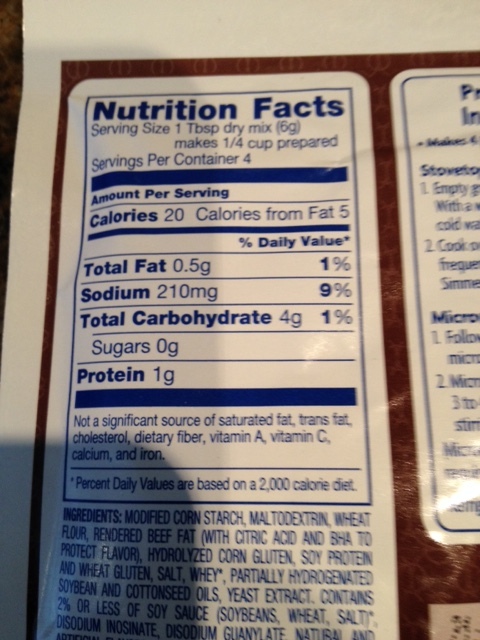 Doc’s has 65 mgs of sodium and 3 grams of sugar in a tablespoon compared with LocalFolks which has 25 mgs of sodium and 2 grams of sugar, so ingredient-wise it’s already at a disadvantage. 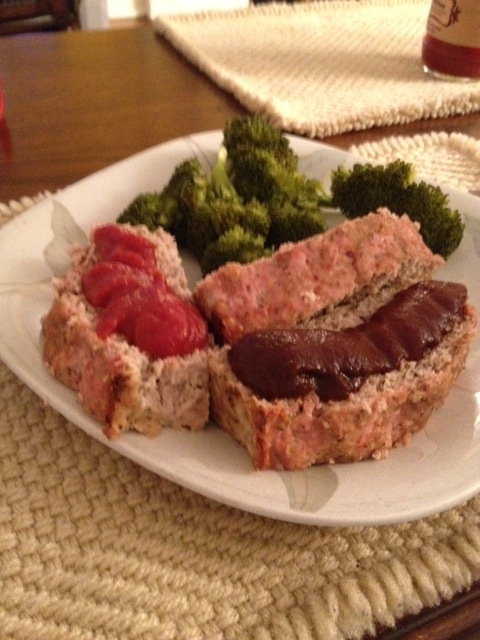 I recently did a side-by-side test of the two on turkey meatloaf I made. Doc’s ketchup, on the right, is brown, not red like LocalFolks, on the left. Doc’s also doesn’t taste like ketchuo. The Doc’s was severely disappointing, tasting more like a peppery barbecue sauce than a tomato ketchup. It’s brown color belies its barbecue sauce taste as does the liquid smoke listed as an ingredient. I don’t want to throw the remainder of it away, so I’m saving it to use on some chicken that I grill this summer to see if it tastes better as a barbecue sauce than as a ketchup. All the low-salt, low-sugar ketchups I’ve found are considerably more expensive than regular brands, so if you buy one, the taste should work for you, it’s too expensive to buy something you’ll ultimately not use. Sorry Doc. Pepsi announced last week that it was dropping aspartame from its Diet Pepsi, a victory for consumers who fear aspartame even though government regulators and soft drink makers say its safe. Love every sip? Not lately, consumers have been shunning diet sodas, worried about aspartame and other sweeteners used. So Diet Pepsi is switching to Splenda. Food and beverage companies are in business to make money, not to harm or kill people as some critics seem to think. The manufacturers will make anything they think people will buy in massive quantities. So the way to get them to stop making things you consider unhealthy is to stop buying them, which is pretty much what has been happening with diet sodas in recent years. Splenda will be the new sweetener in Diet Pepsi. Will that switch reverse the slide in diet soda sales? I’m guessing no, people seem to fear all sweeteners these days, from sugar on down. Stevia is one new darling, several sodas are already out sweetened with that. I’ve written about a brand I tried with Stevia, you can read about it on this link. Give it some time and I’m sure someone will find something bad to say about it too. We are simply in an era of vast distrust of all processed foods. I seem to be talking about tacos a lot lately, but that’s because I’m again enjoying them after finding a way to make them low-salt and low-fat. 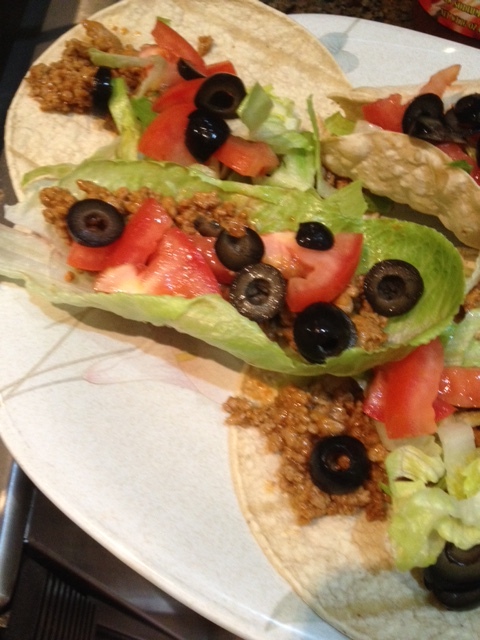 Using lettuce as the outer skin for a taco gets a lot of attention online, but I had never tried it until lately. My verdict — I liked it and likely will try it again. True, there is shredded lettuce in the ingredients I put in, so it’s a bit like having a lettuce sandwich, but there are enough other ingredients to balance that out and keep it tasty. I created my lettuce taco with this variety from Costco, which advertises it’s well-suited to use for wraps. You can see the result here, it was very tasty. 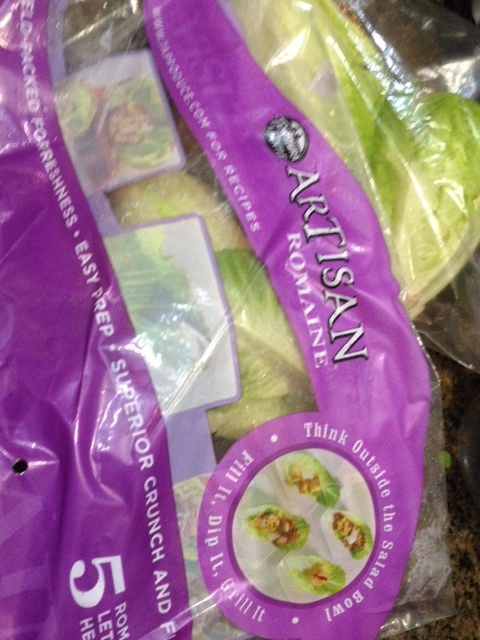 I used romaine lettuce hearts, a variety Costco sells that advertises on its packaging that it’s well-suited for wraps. It really was, the leaves are crisp and hold their own when filling is added. You can see one here along with my other alternative wraps, which I’ve written about before, a low-salt soft tortilla and one I tried to shape into a hard taco shell with mixed results. 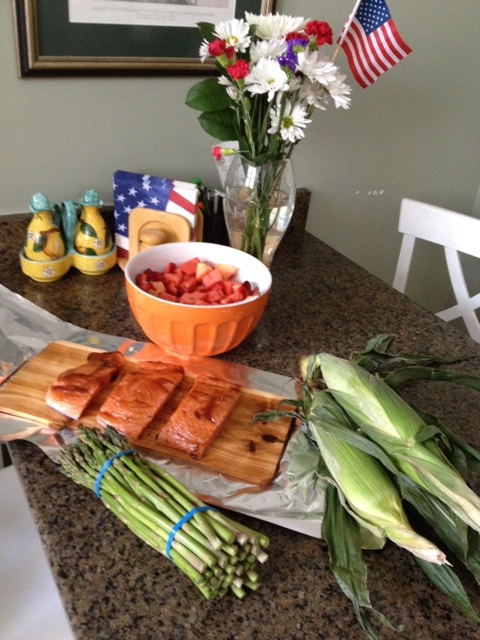 This experience will get me to try to wrap other things in the romaine heart leaves, send me ideas that you’ve tried. Food hack was a new term to me until very recently. I wrote about 28 Brilliant Food Hacks that seemed like good ideas, including one in which you can turn a soft tortilla into a hard taco shell. A brilliant food hack? 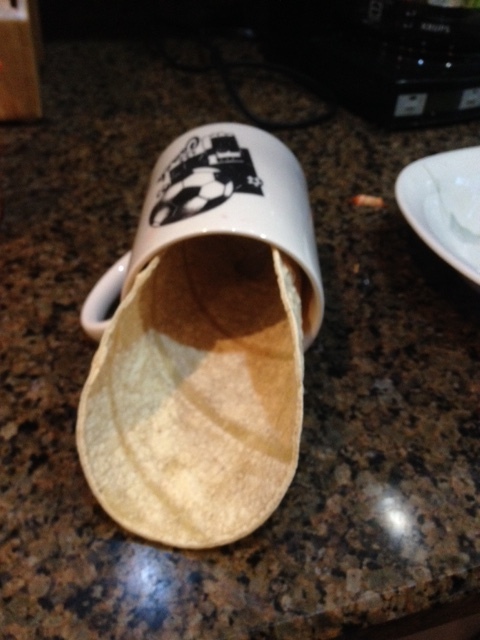 Using a cup to turn a tortilla into a hard taco shells didn’t go exactly as advertised. But I tried that one recently and it left a bit to be desired. The problem may have been that the cup I used, you put the tortilla in a coffee cup and then put it a microwave to harden, was too small for the tortilla. 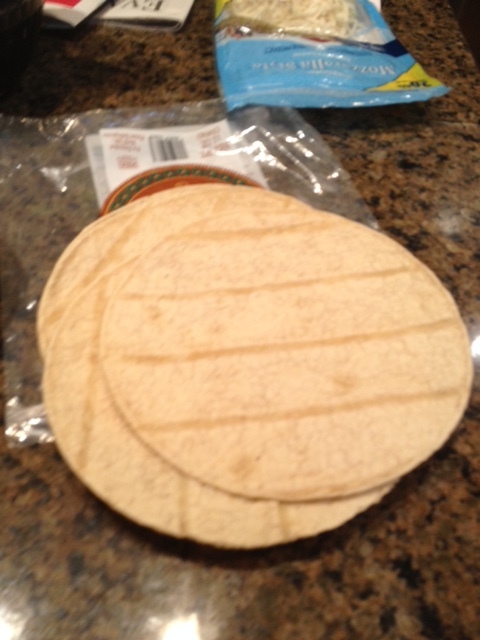 I started with these flat, low-salt tortilla shells from Trader Joe’s. 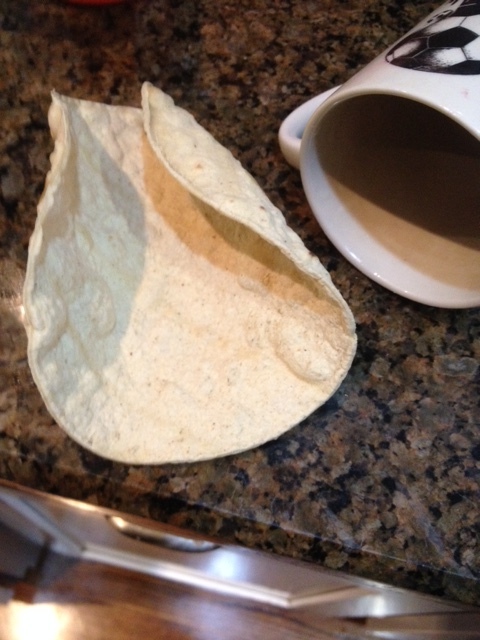 You can see the result here, the tortilla curved on one side, the side in the cup, but remained largely open on the other. A second attempt in which I tried to push it deeper into the cup caused it to split in the middle. Why not just buy taco shells? Because all I’ve seen are extremely high in salt but I have managed to find low-salt tortilla shells. I’ll try this hack again with a deeper cup and see if that helps. It was fun to have a hard shell again, especially one that was low in salt, in which to put my low-fat ground turkey mixture. 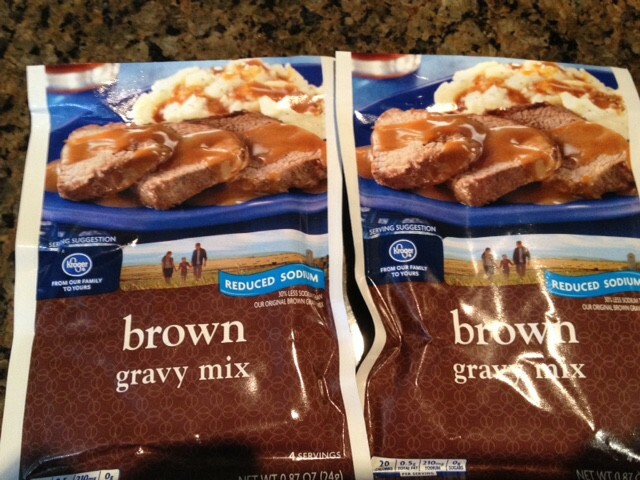 I was recently at Food 4 Less looking for a low-fat, low-salt brown gravy to have with some left-over turkey we had brought home from my in-laws house on Easter. Most prepared gravies are very high in salt, even the fat-free varieties. I have found a salt-free gravy online but didn’t have time to order it in this instance. So after comparing all the prepared gravies and finding them all too high in salt and fat, I looked at the mixes section. Gravy mixes normally are loaded with salt too but I was surprised to find a reduced salt offering in the Kroeger store brand. Kroger’s reduced sodium brown gravy had less salt than prepared gravies but the taste was just ok, it still tasted salty to me. I bought two packets and mixed the contents with water to make my turkey gravy. Each quarter cup, prepared had 210 mgs of sodium, so if you use half a cup, you’re at 410 mgs, about a fifth of my daily salt limit.That’s a significant amount for a condiment. The taste was ok, nothing to write home about. Would I buy this again? I suppose, but not with a lot of enthusiasm. 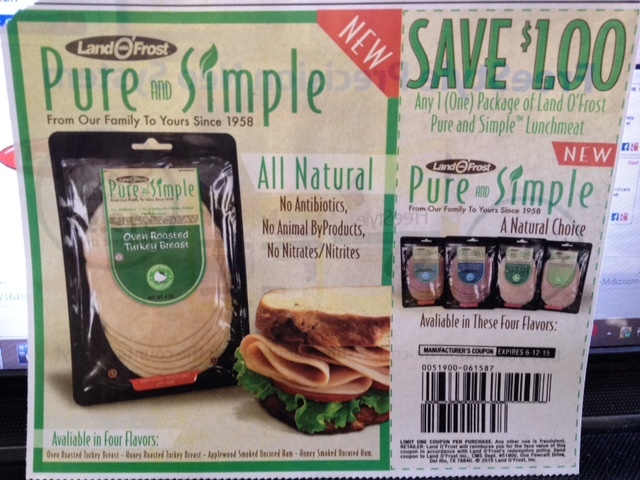 Pure and Simple apparently is a new brand of lunchmeat from processor Land O’ Frost. I saw a coupon for it in my local paper recently and was intrigued. All lunch meats have too much salt for me, and for most people really. Some brands have tried to take out some salt, but as far as I’m concerned, their salt content is still too high. I was hoping this new Pure and Simple line might be different. The coupon ad highlights that this line contains no antibiotics, no animal byproducts and no nitrates/nitrites. Bravo for all of that, especially the last since those have been linked to cancer. I was hoping this new line of lunchmeats had less or no sodium. It has a lot, avoid it. But when I searched out salt content for the new line, I was disappointed. Two ounces of Land O Frost Pure and Simple – Honey Roasted Turkey Breast has 380 mgs of sodium, according to myfitnesspal.com. that compares to 360 mgs in 51 grams, about 1.7 ounces, of the same company’s Simply Delicious line of lunchmeats, so it’s really no improvement. 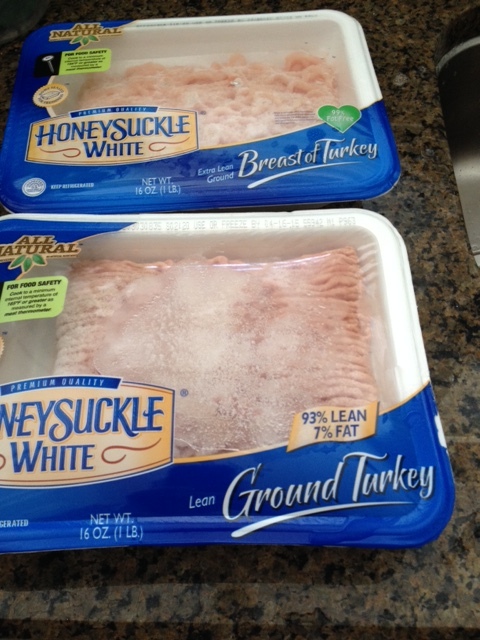 It is less than its Premium line which has 510 mgs of sodium in 50 grams of its turkey. Two ounces of turkey is not a meal for anyone really. I’d need at least six or eight in a sandwich, which would be a day’s worth of sodium for me. So I’ll continue to avoid cold cuts to maintian my low sodium diet.